Q8-DEWANIYA: New Hadiya from Villa Moda. New Hadiya from Villa Moda. 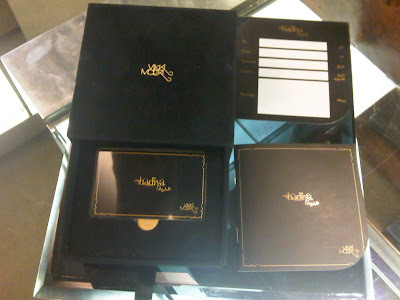 Yesterday was my sister's birthday so i went to Villa Moda to buy her something, and then they told me that there is this new Hadiya concept, which is a gift card, you just have to select the value of the gift card (more than 40K.D and for un limited price) what i liked about it is the way it is boxed and it can be used over several transactions at any Villa Moda boutique in Kuwait, Dubai, Doha and Manama. PS any 100 kd or more you will get 10% extra. Ana gayltlek ena 3eed melady grab mo :P? Love the ideaaaa wanasah 3al agal u dont bother thinkin if she gonna like what u bought her or not ..
ee off 7addah hatha aham shaii inny ma a7atee!